If news of Kylie Jenner and Tyga's relationship filled you with squeals of misty-eyed delight, then I'd venture to say the time to opt for Kylie Jenner and Tyga Halloween costumes has finally come. The controversial couple has been joined at the hip these last few months, despite the age difference so often critiqued by the public. They film music videos together and pig out on junk food together, though, so they clearly have some stuff in common. Spotted rocking coordinating costumes last Halloween while rumors of romance were still mere speculation, 2014 saw Kylie and Tyga team up as fictional Child's Play character Chucky and a gorgeously gothic Bride Of Chucky. They attended Adam Lambert's Halloween party at Bootsy Bellows Nightclub in Hollywood, and I'd be surprised if they didn't take home the crown for "best couples costume." 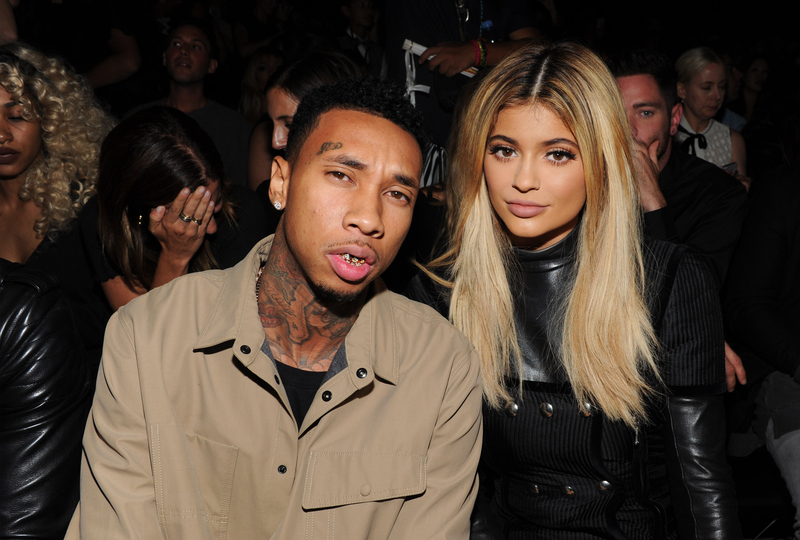 The first rule of Kylie Jenner and Tyga attire is to do your homework. The gruesome twosome was spotted having a spook-tastic time at Universal Studios Hollywood's Halloween Horror Nights on Sept. 25, so that's the perfect inspo for scare-worthy ensembles. The second rule is: Have fun with it. And the third rule is: Absolutely anything can make a great costume, with the right attention to detail. To get your Kylie Jenner and Tyga dress-up hat on, peruse through the ideas below for spookspiration. If Kyga's Chucky and Bride Of Chucky transformation in 2014 filled you with wide-eyed terror and costume envy in equal measure, then why not recreate your idols' gory Halloween looks yourself? Don't forget to add a little attention to detail with some Child's Play themed props, too — like this scarily realistic-looking plastic axe, complete with theatrical blood to scare passerby as they wonder who your last victim might have been. When it comes to looking your Bride Of Chucky best, you'll want to make sure you have the accessories to match. This dagger looks freakily real (although it's actually only rubber), so simply douse on the stage blood above to quicken the pulse of your prey. What would the Bride Of Chucky be without her haunting dress? This one's available in sizes 4 to 18. Conversely, you can order yourself a beautiful wedding-esque dress that you can re-wear on many occasions post-embodying Chucky's bride. Finish your outfit with these horrifyingly bloodied thigh-high stockings. Don't forget that with this look, a little bit of adept face painting goes a long way. Once you've mastered Tyga's scream-worthy scars and Kylie's picture-perfect black pout, you'll be ready to hit the Halloween party as a gruesome twosome and say, "Hi, I'm Chucky... Wanna play?" To ensure that people know you're dressing as a new and improved Kyga-esque Chucky and Bride as opposed to the originals, all you have to do is pay attention to the little details. For Kylie Jenner, go for a perfectly lined black pout and a Jenner-worthy wig. For Tyga as Chucky, accessorize with the sort of bling, snapbacks, and sneakers that any self-respecting Tygaholic would showcase with pride. Don't forget a custom six panel cap from Tyga's own clothing line, Last Kings. You'll also need Tyga-themed grillz, of course, to give your pearly whites that special edge. Perhaps you'd prefer to recreate Kylie and Tyga's cozy cool high school football look, as sported between takes on the set of Tyga's new music video. Chill enough to be worn for both daytime and evening while also looking suitably sharp and slick, this look is all about the details. Tyga matches his yellow sneakers to Jenner's jacket sleeves, while Jenner looks her usual smart, well-coiffed self. Don't forget to master the Kylie Jenner pout and one of her signature 'dos, of course. And buy your varsity letterman jacket in a men's fit to copy Jenner's oversized, slouchy cool look. For true authenticity, why not clothe yourselves as the star-crossed lovers' doppelgängers? Simply browse the Tyga, Kylie Jenner, or even the Official Kyga Instagram pages for styling tips. I chose Jenner's signature look of slick black leather with a simple white T-shirt for statement monochromatic glamour, while leaving Tyga clad in typical basketball-themed regalia. Remember, the Kyga-themed world is your oyster. Want more Halloween fun? Check out the video below, and be sure to subscribe to Bustle’s YouTube page for more excitement!